The Court of Appeal in Abuja on Tuesday suspended indefinitely its hearing into motions brought by the Ahmed Makarfi faction of the Peoples Democratic Party, PDP. The appeal court said its decision followed a petition filed by one of the parties in the matter on Monday. A panel of three judges led by Jumai Sankey said that its integrity was compromised by a petition filed against it by Biyi Poroye, a member of the PDP faction led by former Borno State governor, Ali Sheriff. Ms. Sankey said the petition was forwarded to the President of the Court of Appeal, Zainab Bulkachuwa. She said the petitioner alleged that the court, under her leadership, was prone to being compromised for financial gains. Subsequently, the three judges on the panel withdrew their participation in the case, pending the determination of the petition by the judicial body responsible for the investigating such matters, the National Judicial Council, NJC. Ms. Sankey said a copy of the petition was also sent to the NJC. She said her panel would return the case files to the President of the Appeal Court. The court was scheduled to decide on the validity or otherwise of previous judgements from lower courts on the crisis within the PDP. A faction of the party led by former Kaduna State governor, Ahmed Makarfi, and another by former Borno State governor, Ali Sheriff, have for months battled in court over the leadership of the PDP. As part of that battle, the faction led by Mr. Makarfi had approached the appeal court to seek nullification of previous decisions by a Federal High Court presided over by Okon Abang which has affected that faction’s candidate for the November 26 governorship election in Ondo State. Mr. Abang had on October14 given an order in furtherance of his June 29 decision where he had asked the Independent National Electoral commission, INEC, to recognise the faction led by Mr. Sheriff. In his October 14 ruling, Mr. Abang nullified the listing by INEC of the candidate of Mr. Makarfi’s faction, Eyitayo Jegede, for the Ondo State governorship election. The judge said the decision was premised on his June 29 judgement where his court declared as null and void the proceedings of the PDP convention which appointed a caretaker committee with Mr. Makarfi as chairman. Shortly after that decision, the Makarfi caretaker committee approached the appellate court to demand a stay of execution of Mr. Abang’s October 14 decision. At that time, Mr. Jegede had been recognised by INEC as the party’s flag bearer and the supporters of the Makarfi-led faction said the status quo should be maintained, pending the determination of their appeal at the appellate court. Mr. Jegede also approached Mr. Abang’s court, according to the rules of the Federal High Court, to seek his permission to appeal the October 14 judgement. That appeal was denied by Mr. Abang on October 27. During his ruling on Mr. Jegede’s application, Mr. Abang reiterated his decision that Mr. Ibrahim remains the authentic candidate for the PDP in the coming election of Ondo State. In deference to the October 27 decision of the Federal High Court, INEC withdrew its recognition of Mr. Jegede and had him replaced by Mr. Ibrahim. Consequently Mr. Jegede and other members of the party from Mr. Makarfi’s faction made further appeals to the Appeal Court demanding that it strikes out the June 29 ruling by the Federal High Court as well as that of October 14. Those appeals were what the appellate court was scheduled to determine on Tuesday. 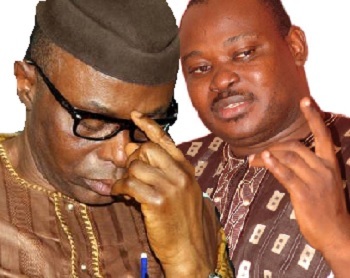 INEC had said Mr. Ibrahim would remain the candidate of the party in Ondo until a ruling by the appeal court.